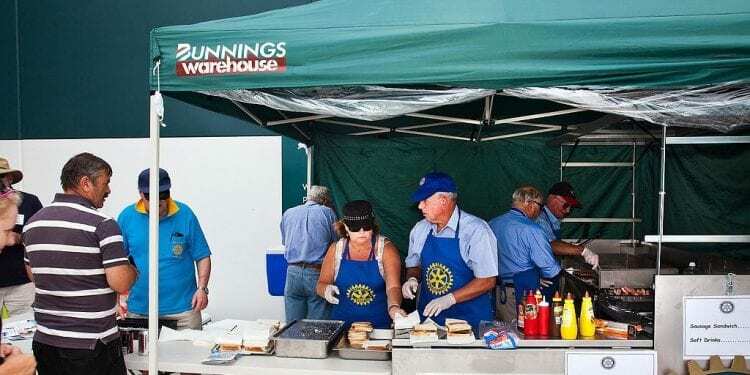 Bunnings have set a new rule for the way snag sandwiches from the community sausage sizzles are served outside their stores, and Australia is not happy. From now on, the sausages served by volunteer fundraisers at Bunnings must be placed in the bread on top of the onions. According to the retailer it is in response to Occupational Health and Safety concerns that fallen loose onions may cause a slipping hazard. On Tuesday, Bunnings Chief Operating Officer Debbie Poole confirmed with Melbourne radio 3AW the new rule, assuring customers that the impact on their lives would be minimal. “Safety is always our number one priority and we recently introduced a suggestion that onion be placed underneath sausages to help prevent the onion from falling out and creating a slipping hazard,” Ms Poole said. “Regardless of how you like your onion and snag, we are confident this new serving suggestion will not impact the delicious taste or great feeling you get when supporting your local community group,” she added. It’s my biggest fear when going to Bunnings, the number of onions i have tripped over… my lord, every freakin sunday…. In an attempt to calm nerves and unite the country, Prime Minister Scott Morrison responded when asked about the Bunnings sausage sizzle furor. “Whether the onions are on top or underneath, I’ll always be buying sausages on bread,” Mr Morrison assured the nation.